My bright white, wedding smile mission is well and truly underway. 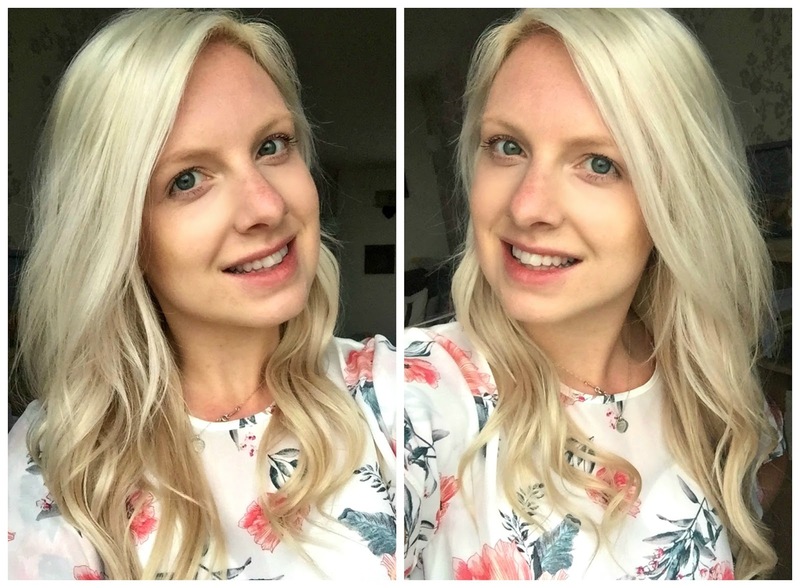 From charcoal polish to bright pink toothpaste I'm open to trying out different products and when a brand brings out a new product I'm up for checking it out. 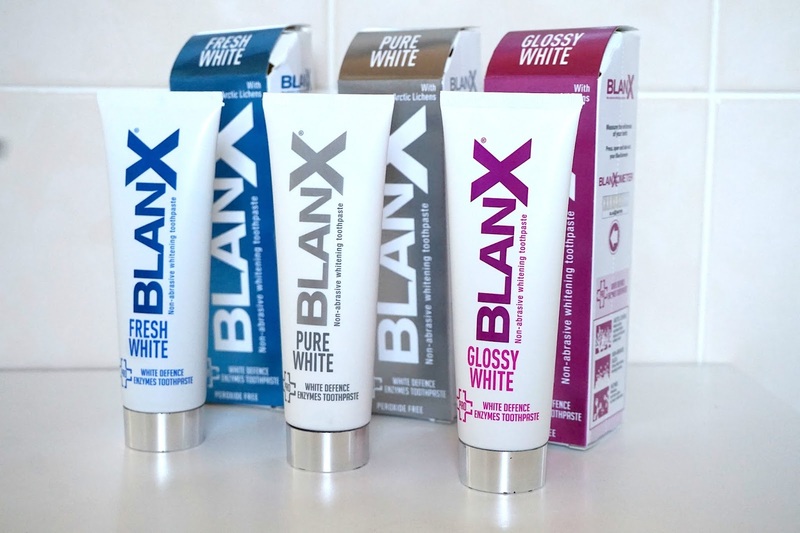 BlanX has been around for a while (launched in 1990 apparently), but their BlanX Pro range is new on the scene with 3 different toothpastes in the range; Fresh White, Pure White and Glossy White. The BlanX Pro trio are designed to be everyday toothpastes with non-abrasive ingredients to whiten and protect. I tend to think if it's gentle enough to be used on a daily basis that it's not going to be strong enough to make much of a difference to whiteness but there's silicas and enzymes in there to get to work against the bacteria and dental yellowing. 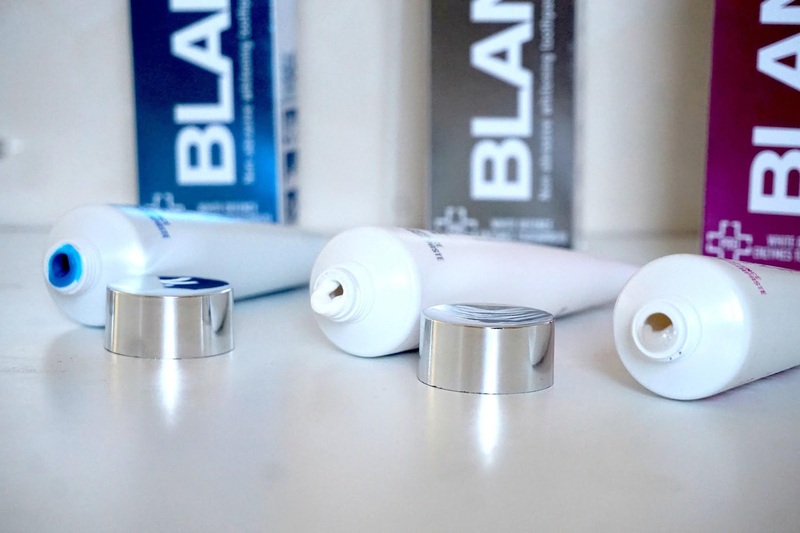 All three BlanX Pro toothpastes aim to do the same thing - whiten your teeth gently and naturally, everyday. Each one differs slightly and so they can suit different oral hygiene needs to a certain extent. They are all packaged similarly with a 75ml tube in a bold coloured box and a shade chart on the side. Normally I'm not too keen on a twist lid on a toothpaste but I've found there's been absolutely no mess and they stand proudly at the side of my sink. BlanX Pro Fresh White is an amazing blue colour and I actually love how it looks, and for once its a bright toothpaste that doesn't stain the sink and make a mess. This toothpaste focuses on tackling halitosis. Zinc PCA is an antibacterial ingredient which counteracts bad breath and I have to say I did feel refreshed after using it at night or in the morning. BlanX Pro Pure White is all about the enamel surface of your teeth. It gets to work from the first use to remove stubborn stains and bring back your natural shine. I think this was the toothpaste that I noticed the biggest change in some of my teeth further back, the ones that tend not to brighten. BlanX Pro Glossy White is more of a clear toothpaste and I was actually expecting it to be a bright pink paste just going from the packaging. This one has micro-particles which are meant to fight stains and leave teeth shiny and white. I'm not 100% convinced that my teeth are much shinier but they did look whiter. Okay, so I'm no Jack from Love Island but my teeth definitely look brighter and whiter. 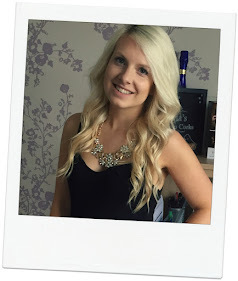 As I said before, when a whitening product is suitable to be used everyday it's not going to be packed full of harsh ingredients and so you're not going to be getting an outrageous transformation. They definitely tackle everyday discolouration and marks but if you've got any long-term staining or particularly discoloured teeth then this isn't going to be tough enough. I'm tempted to try something a little stronger to make some major shade changes then let BlanX Fresh White, Pure White or Glossy White do the upkeep. I've enjoyed using all three of the BlanX Pro toothpastes. They taste minty and fresh and leave me confident with my smile. I would buy them again (though maybe when they're on offer because I'm more a £1 or £2 sort of toothpaste shopper) and continue to use them everyday, they all leave my teeth feeling squeaky clean.